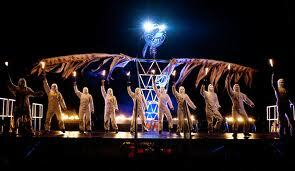 “The Phoenix” was a site-specific piece by the company Vision Mechanics in November 2010, symbolising the regeneration of Greenock in Scotland. 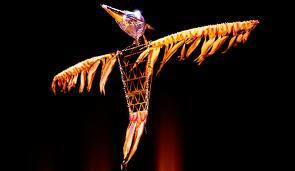 A huge 25ft high bird puppet was hoisted by a crane and “flew” over the heads of the large crowd at the open air location, while a group of dancers with flaming torches performed before it. The three sections: “At Rest”, “Awakening” and “Flight” were accompanied by almost 16 minutes of recorded music. For this Steve used his usual armoury of saxophones and flutes, plus melodica, jaw harp, conch shell, and a bewildering array of percussion, including frying pan, colander, wok lids, gongs and drums.